"Trevor MacDonald" redirects here. For the transgender health researcher, see Trevor MacDonald (health researcher). Sir Trevor McDonald, OBE (born George McDonald; 16 August 1939) is a Trinidadian-British newsreader and journalist, best known for his career as a news presenter with ITN. After working as a print and broadcast journalist in Trinidad during the 1960s, in 1969 McDonald was employed by BBC Radio as a producer, based in London but still broadcasting to the Caribbean. In 1973 he began his long association with Independent Television News, first as a general reporter, later as a sports correspondent, but ultimately concentrating on international politics. In the 1980s he spent some time with the ITN-produced Channel 4 News, but returned to ITV in 1989, presenting the early-evening news. McDonald was promoted in 1992 as the sole presenter of News at Ten and became a well-known face on British television screens. McDonald stayed with ITN when News at Ten was axed in 1999, moving to present the new ITV Evening News. News at Ten was briefly relaunched on 22 January 2001, to which McDonald returned as a presenter. He presented the ITV News at 10.30 following News at Ten's second axing. From 1999 to 2005 McDonald hosted ITV's flagship current affairs programme Tonight with Trevor McDonald. The show was revived in 2010 with presenter Julie Etchingham. On 29 November 2005, speculation that McDonald was about to leave ITV to work elsewhere ended when he signed a further two-year contract involving producing both a documentary show and a new series of interviews which will be of a wider general interest. McDonald presented his last ITV News bulletin on 15 December 2005. The veteran newsreader stepped down from his role as anchor after more than 30 years at ITN, but said he had no plans to retire completely from television. At the end of the final programme, he signed off with the words: That brings to an end my association with the news at 10.30. Thank you for watching. Over the closing titles of the last bulletin that McDonald presented, the November 1992 to March 1999 ITV News at Ten theme was played as a tribute to McDonald. On 31 October 2007, ITV announced that, early in 2008, McDonald would come out of retirement to present the relaunched News at Ten together with Julie Etchingham. He told a newspaper: "I couldn’t turn down the move back to that iconic time slot." News at Ten began broadcasting once again on 14 January 2008. It was announced on 30 October 2008 that McDonald would step down from News at Ten once the US 2008 Presidential elections were over, to be replaced by Mark Austin. His last bulletin was on 20 November 2008. It was reported at the time that he would continue to present links for The Tonight Programme. In 2009, McDonald travelled to the Caribbean and hosted the series The Secret Caribbean with Trevor McDonald. Three parts. In 2011, McDonald travelled around the Mediterranean and hosted the series The Secret Mediterranean with Trevor McDonald. Four parts. In 2012, McDonald travelled along the route of the Mississippi River and hosted the series The Mighty Mississippi with Trevor McDonald. Three parts. In 2013, McDonald visited death row inmates and hosted the series Inside Death Row. Two parts. In early 2015, McDonald travelled to New York City and hosted the 2 part series The Mafia with Trevor McDonald. In late 2015, McDonald presented Las Vegas with Trevor McDonald, a two-part series for ITV. In September 2016, McDonald presented a two-part series called Inside Scotland Yard With Trevor McDonald for ITV. McDonald has been announced as host for 2016's BEAM Awards; the first BEAM awards ceremony to be televised. Alongside Aleesha Dixon, Sir Trevor McDonald will host the awards at the London Palladium. McDonald presented the TV series Undercover Customs which created reconstructions of major HM Customs and Excise investigations in the UK. He replaced Kirsty Gallacher for Ant vs. Dec on Saturday Night Takeaway in 2005 due to Gallacher at The Games. From 1996 until 2008, McDonald presented the National Television Awards. He was replaced as presenter for the 2010 event by X Factor host Dermot O'Leary. On 21 April 2006, McDonald presented an episode of Have I Got News for You; he delivered a number of autocue jokes, some of which were extremely risqué, in his usual sober newscaster manner, the juxtaposition of which prompted team captain Paul Merton, who usually maintains a straight face on the show, to laugh heartily in disbelief on numerous occasions. It was McDonald's first appearance in any capacity on the show since 1992. McDonald is Chancellor of London South Bank University. He also has intimate ties with King's College School in Wimbledon, a London day school, where he is now a governor. McDonald is the author of biographies of the cricketers Viv Richards and Clive Lloyd. McDonald has worked as an editor of poetry anthologies, and his autobiography Fortunate Circumstances was published in 1993. Lenny Henry's comic character Trevor McDoughnut is a spoof of McDonald. McDonald once surprised Henry during a performance of "McDoughnut" on Tiswas by walking into the studio to sit with Henry. McDonald returned to Tiswas on two further occasions. First, a number of weeks after his original surprise appearance, he cropped up during a spoof edition of This Is Your Life to "reminisce" with Lenny Henry about the earlier event. The other appearance occurred during the Tiswas Reunited show (a reunion programme transmitted in June 2007) where McDonald joined Lenny on the sofa once again to look back at the old clips and comment on Henry's impersonation. McDonald performed live in Hyde Park in summer 1996 with the Who, as the newsreader in the group's staging of their Quadrophenia. In June 2007, McDonald hosted the new ITV version of This Is Your Life, Simon Cowell being the programme's "victim". In August 2010 McDonald conducted a live on-stage interview with Archbishop Desmond Tutu at Fairfield Halls in Croydon at an event entitled An Audience with Desmond Tutu. A picture of McDonald was seen at the end of the video I Know Him So Well by Peter Kay and Susan Boyle for Comic Relief 2011. A clip from one of McDonald's news broadcasts was shown in the 2011 film The Iron Lady. In January 2013 a series entitled Inside Death Row with Trevor McDonald aired on ITV in which McDonald visited Indiana State Prison interviewing inmates on death row. In May 2013 he visited Rockville Correctional Facility and the Indiana Women's Prison in Indiana interviewing additional inmates. During 2013/2014 Sir Trevor was President of Surrey County Cricket Club. On 30 October 2014, he appeared in the introduction to Rebel Sound's first round performance in the Red Bull Culture Clash 2014. McDonald holds honorary degrees from the University of Plymouth and Liverpool John Moores University. In 1992, he was awarded an OBE in the Queen's honours list. He received a knighthood in 1999 for his services to journalism. He was awarded with a BAFTA fellowship at the 2011 British Academy Television Awards. 1 2 "Gongs and bongs". The Daily Telegraph. 11 June 2001. Retrieved 27 October 2016. 1 2 3 4 5 6 7 8 9 "Newsworthy career of Sir Trevor". BBC News. 15 December 2005. Retrieved 28 December 2011. ↑ "Sir Trevor McDonald – Media Top 100 2003". The Guardian. 7 July 2003. Retrieved 20 May 2009. 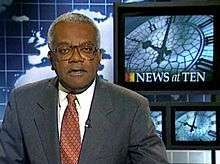 ↑ "Sir Trevor reads final bulletin". BBC News. 15 December 2005. Retrieved 20 May 2009. ↑ Who's Who, London, A. & C. Black (2009). ↑ ITV News at 10:30, Trevor McDonald's last bulletin (15 December 2005) on YouTube. ↑ "News at Ten returns to ITV". itv.com. 31 October 2007. Retrieved 31 October 2007. ↑ "Diamonds are for Trevor", The Sun, 2 November 2007. ↑ "Martha Kearney's week", BBC News, 13 January 2008. ↑ "Sir Trevor McDonald to leave News at Ten next month", The Guardian, 30 October 2008. ↑ "Sir Trevor McDonald quits News at Ten", The Telegraph, 30 October 2008. ↑ The Secret Caribbean with Trevor McDonald, ITV. ↑ The Secret Caribbean with Trevor McDonald, ITV Press Centre, 19 June 2009. ↑ The Mafia with Trevor McDonald, ITV. ↑ Inside Scotland Yard With Trevor McDonald, ITV, 27 June 2016. ↑ Carlos Korotana, "UnderCover Customs (1997– )", IMDb. ↑ "Wimbledon boys' school considers admitting girls", Your Local Guardian, 7 September 2008. ↑ "Sir Trevor McDonald on TISWAS" on YouTube. ↑ "Simon Cowell is first celebrity 'victim' for revived This Is Your Life", London Evening Standard, 24 May 2007. ↑ "An audience with Desmond Tutu", The South African, 2 August 2010. ↑ "Archbishop Desmond Tutu sends Croydon a message", Croydon Guardian, 26 July 2010. ↑ "Deal With the Media with Sir Trevor McDonald". Deal With The Media. ↑ "Alastair Stewart to receive Honorary Doctorate from University of Plymouth", Plymouth University, 7 September 2010. ↑ Honorary Fellows of Liverpool John Moores University, LJMU.